Some people thought jazz is all about cozy, relaxing, nice and easy tunes. Some others thought that its the kind of music that’s difficult to listen, full of complexity, puzzling and hard to chew. Then, there are people who demand vocalists most specifically ladies, ask them to sing love songs and describe it as jazz. Don’t we see many venues have it in their perspective? The truth is, there are more than 70 hybrids or sub genres of jazz today, from those pop-ish, the nice and easy, the mainstream, the modern and traditional, up to the loud, rebelious sides jazz wich often deliver with distortion the way rock stars do. Well, we can find jazz everywhere, and jazz can be played in whatever style. You can have it with modern, western instruments, but you can also present it by using local traditional instruments. Or the combination. Et cetera. One thing you have to know is jazz is a dynamic, progressive music that’s keep growing, expanding and giving birth to many new hybrids. It was like that, it still is now. At this Braga Jazz Walk we have many homeworks. On the surface, just like any other music event, we are doing our best to provide jazz-tertainment which is accessible and free of charge. But underneath that mission, we are dealing with the regeneration process of jazz (related) musicians, trying to invite the young players to try playing this music while at the same time providing playground for the jazz musicians to perform. Then, we also have to introduce the wide variety of jazz, showing how open jazz actually is toward the other genre and all the possibilities that can be brought inside thi particular music. This event should become the destination for those who need to promo themselves and/or their latest work and certainly a reliable source if one need some talents for their event. In the end, we wish Braga Jazz Walk to be a comfortable home for anyone, from jazz fans, musicians and music lovers in general. Together with our partners in crime Braga CityWalk and KPH Music, we are commited to bring it all on. Here we come to the Braga Jazz Walk #09. Who will be there under the spotlight this time? First, let’s see a kid prodigy who we found by surprise when we visited Venche Music School last year. At that time he was having a class with Mr Mochamad Yahya Salam who directed him very well into jazz. His name is Kafin Sulthan Reviera, still 10 years old but you’ll be surprise when you see him on stage. This boy can sing very well while playing piano, and he can draw like a pro too. You can see how great he can play and sing here: https://www.youtube.com/watch?v=ge5WCnn2MCU or when he did vocalese jazz with Indra Aziz https://www.youtube.com/watch?v=PkAS5x6swPA. Kafin is still a boy, but he’s not an ordinary kid. He’s pursuing his formal study by taking homeschooling, level third grade of Junior High School. Musically speaking, he has taken vocal lesson since 5 year-old and digged jazz on piano 3 years after. 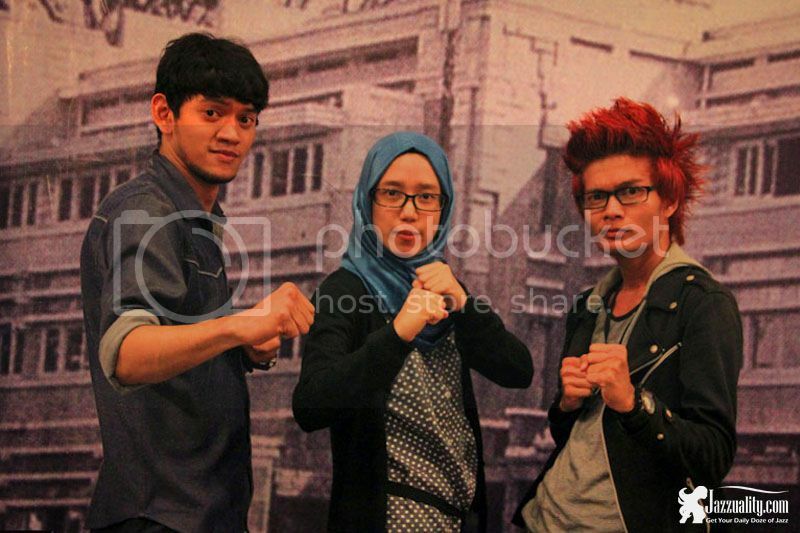 He starred in Mira Lesmana and Riri Riza’s Laskar Pelangi, Musical Drama Theatre in 2012. 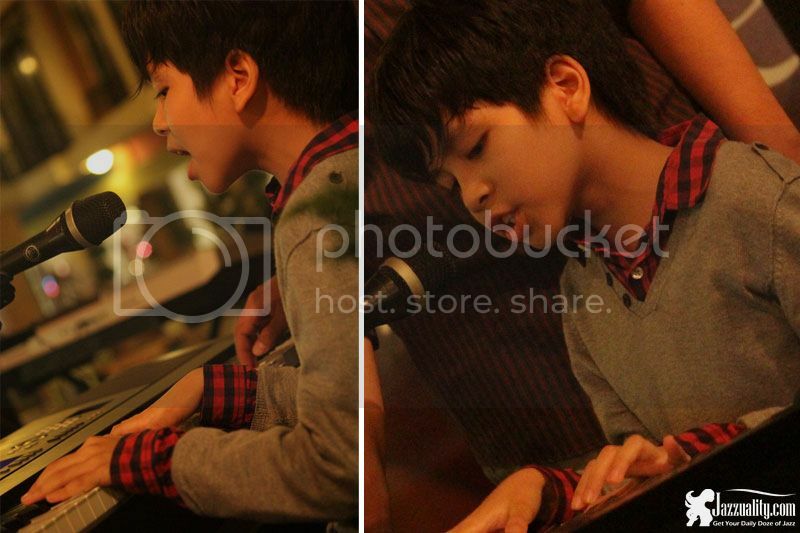 Then, he joined Erwin Gutawa’s ‘Above Average’ kids project which is currently in the process of recordings and concert. More, Kafin is now busy doing singing and coreo practice for Disney. Yes, Kafin is a part of Mickey Mouse Club Indonesia that will be aired on Disney Channel this year. When we invited him last year to perform at the tryout of Terraz Jazz, he successfully wowed everyone (read the report here: http://jazzuality.com/jazz-event-report/citylink-jazz-n-jam-terazzo-jazz-the-report/). At that time, he said that jazz is actually his thing. Last August he went to Bali International Jazz Summer School and now the ‘enhanced’ Kafin is more than happy to show his progress at Braga Jazz Walk. Do come early, because he’s going to appear first. You have to see him, seriously. The second to mention is a jazz trio named Etudiant (French word for ‘student’). This interesting trio consists of female jazz pianist Tiurma Tizadya Ramadhani Siregar and two active personnels of Isola Jazz: Ilham Septia Inda Nugraha (bass) and Galih Cahya Nugraha (drums). The band was formed not too long ago in October 2014, but they are definitely not a newbie. Experienced in every corner, they can spin any songs including those with difficult arrangements. We don’t see many jazz trio anymore, so we put high hope to this one. They played at the fourth edition last November, it’s time to reinvite them again and see what’s new from them. If you’re looking for a jazz trio with good chemistry, this one’s worth to check. We haven’t featured fusion jazz ethnic for quite some times. So now it’s a perfect time to invite Hariring, a Sundanese word meaning humming or sing gently). 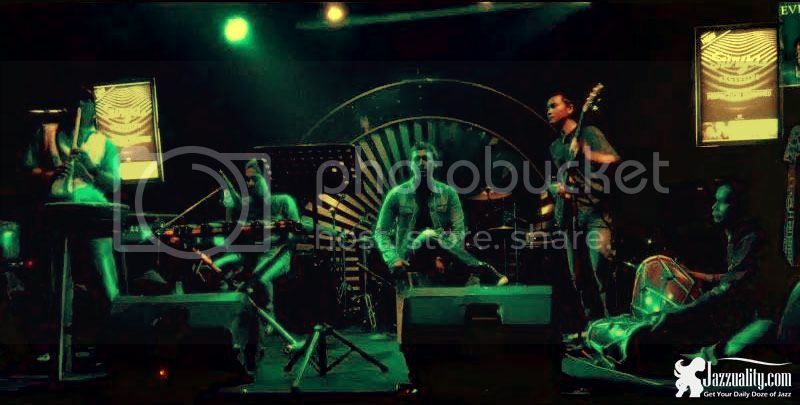 Hariring is a cool, unique and creative ensemble who collaborates modern and traditional musics, from Jazz, Blues, Rock, Fusion, Soul, Dance to the traditional West Java Sundanese music. Not just the sound, but also the instruments. They do use the modern, western instruments like electric bass, fretless, piano, keyboard, synthesizer but also some traditionals including angklung, suling (bamboo flute), kolintang and bonang (a row of small, horizontally-laid gongs that function melodically), kacapi (Sundanese zither-like instrument), saron (a set of seven bronze bars placed on top of a resonating frame) and kendang (the double-headed drums) among others, plus some samplings. The ensemble consists of daring musicians who understand how to carry this concept including Ringga Hardika (electric bass, fretless electric bass, piano, keyboard, synthesizer, angklung, suling, gamelan sampling, percussive sampling and live programming), Ares Rudhiansyah (kendang, suling, ethnic percussions), Resya “Eca” Firmansyah (Kolintang awi, kacapi, angklung, bass, bonang, saron), Asep Everbeat (cajon, percussions), Toni Besot (kendang), also featuring Fregian (lyrics) and Athu (sinden: traditional Javanese/Sundanese vocal). If you want to know them better, you can visit this page http://ringgahardika.webs.com/hariring or http://ringgahardika.blogspot.com/2014/12/the-hariring.html. By visiting those sites you can hear the songs, you can watch their videos or even, download their 1st album, Fall in West for free. As usual, jam session will be provided after the showcases. Anyone can join in, whether you are jazz musicians, students or even someone who wish to experience playing some jazz on stage. We believe this is going to be an interesting. A kid prodigy, a solid jazz trio and unique ethno-jazz fusion are going to spice this 9th edition. We hope you all can join and have a jazzy party with us. 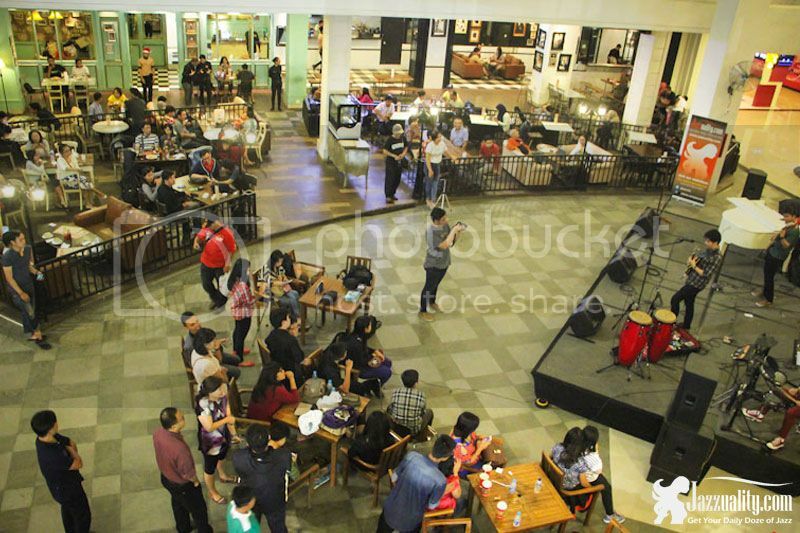 No event will last without the audience, and it certainly won’t work without participation of musicians. Therefore we need your support too in order to keep this event running. If you live or happen to be in Bandung next week on Thursday (January 22, 2015), do come and enjoy the show.